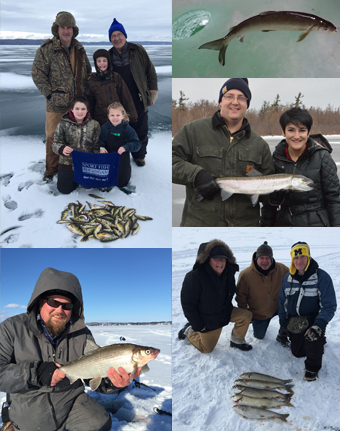 Ice fishing with Wolfe Outfitters in Michigan is an experience not to be missed. All equipment necessary for a great day on the ice is provided, including shanties, heaters, rods and reels, and bait. Transportation on and off of the ice is also included with most of our trips, when safe and practical. 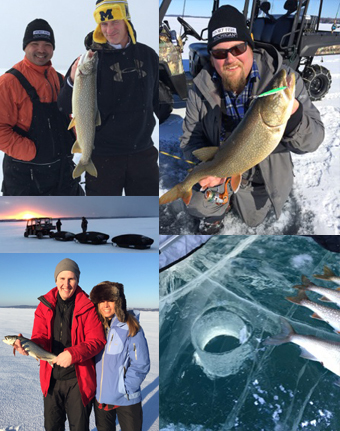 Focusing mainly on northern Michigan's fertile ice fishing waters, Wolfe Outfitters is able to accommodate both small and large ice fishing parties with our experienced guides. Most of Wolfe Outfitters' ice guides are US Coast Guard licensed Captains, helping to ensure your safety and comfort while ice fishing. Fishing many of the northern Michigan inland lakes as well as some of the bigger waters like Grand Traverse Bays, Suttons Bay, Muskegon Lake, Torch Lake, and Crystal Lake, our Guides put customers on fish, and teach them how to safely fish and enjoy themselves. Whether you're a novice or seasoned ice angler, we can help create a fun and productive winter ice fishing trip. Guided ice fishing is a fantastic way to get out and enjoy fishing in Michigan during the winter chill. You will fish from a covered ice shanty outfitted with a propane heater to keep you warm. Transportation on and off of the ice is usually provided by a 4-wheel ATV or snowmobile, taking customers directly to the ice shanties, adding a fun and exciting way to begin and end each day. 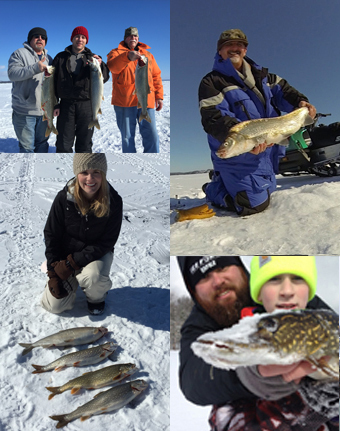 Wolfe Outfitters' guides are glad to share their knowledge of local fishing for a variety of species like yellow perch, bluegill, lake trout, whitefish, walleye, smelt, pike, burbot, and even steelhead. Safety and comfort are our priority, and each guide is there to help ensure a fun, safe, and memorable outing. Our guides reserve the right to change the body of water, or to cancel a trip, if there are weather or safety concerns regarding safe ice. 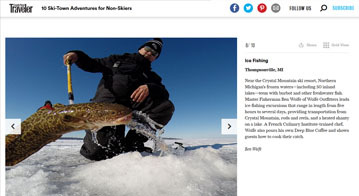 Ben Wolfe and Wolfe Outfitters are featured in an article in Condé Nast Traveler - "10 Ski-Town Adventures for Non-Skiers." Winter is a great time to fish for steelhead in Michigan! Steelhead provide exciting winter fishing trips in northern Michigan. These fighters make blazing fast runs, leap, and will strike savagely even in cold temperatures. Steelhead remain in the rivers after their fall salmon roe feast, creating great opportunities for winter river fishing. Winter steelhead guided fishing trips are a terrific way to enjoy the beauty and serenity of Michigan's rivers. For fly anglers, simple and highly effective beads are a preferred choice for our guides. Additionally, fly anglers can use stone fly nymphs for steelhead holding by gravel. Stoneflies are a proven way to tempt steelhead during their long winters. Also, for our fly anglers, we offer the option to use two-handed rods for switch rod or spey techniques, fishing the waters through the use of cross-current drift. The beautifully colored flies used can yield heart-stopping strikes. 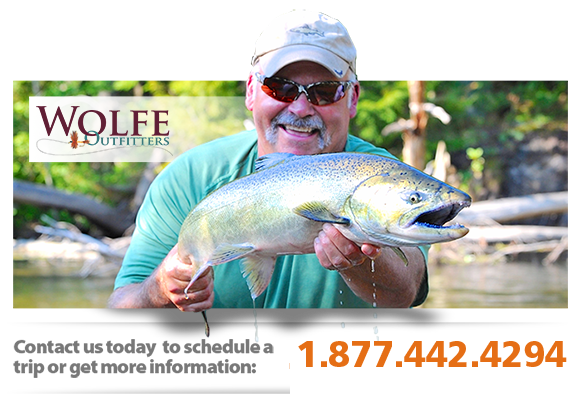 For conventional gear anglers, Wolfe Outfitters uses cured salmon or steelhead spawn. The spawn is tied into various sizes and colors of mesh spawn bags. Spawn bags can also be tied so that they are neutrally buoyant, via incorporating small Styrofoam balls. Other spawn bags are created to sink. Whether rolling spawn along the bottom or under a float or back-bouncing - the technique dictates the type of spawn bag needed. Anglers can use inline spinners for remarkably vicious strikes. Spinners are effective in slightly warming water, when the fish are more active in the true wintry cold. Additionally, beads an incredibly deadly way to target steelhead in the winter. Every day on the water is different - the exact bead color and size may vary. It's hard to pinpoint exactly what it is about plastic beads that steelhead find so attractive, but there is no doubt that they eat them aggressively. Winter steelhead trips can be done from our either drift boats or jet-sleds. Most of Wolfe Outfitters winter steelhead fishing trips will be on the Big Manistee River. The Betsie and Platte Rivers are also great choices if open water is available. Traverse City's Boardman River may also be an option late in the winter, depending on the rate of thawing. In general, the Manistee River has the largest flow, and creates the best opportunities for winter steelhead guided fishing trips. What to Wear: Properly layered clothing is essential. Jeans are not recommended, because they do not hold heat well. Thermal underwear is nearly a must, with added insulated layering on top. Gloves and hats are highly recommended - extremities are crucial to having a great time on the winter water. We keep propane heaters on the boats - but once you get chilled, it can be difficult to heat up again and stay warm and comfortable. To ward off the cold, it is better to look like the Michelin Man!